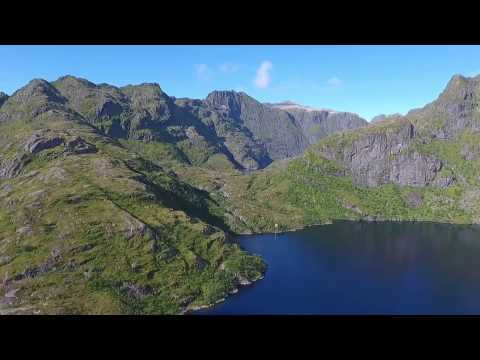 If you're in Sørvågen and don’t have the time or energy to climb one of the iconic summits of Moskenes Island, here’s a short hike that will take you to the shore of the mysterious lake of Trolldalsvatnet (lake of the valley of the Troll). The rest of that mass of water surges into the bottom of narrow valley surrounded by impressive cliffs. The access trail goes through a natural landscape worthy of Scandinavian tales, as it runs alongside of lakes, misty undergrowth and tumultuous waterfalls. The combination is enough to amply justify the name that was given to this place. Behind the village of Sørvågen, take the trail that goes over a rocky mound, under the electric line, toward the little valley that goes up to Stuvdalsvatnet Lake. At the foot of the valley, just after you cross the stream on a little bridge, take the left-hand trail that goes up the hill over the waterfalls to the outlet of Stuvdalsvatnet Lake. Cross the outlet of the lake by going over a second bridge and take the trail to the right after the bridge (the left-hand trail goes to the Tindstinden summit). The trail follows the lakeshore for about 500 yards. Some banked passages may be slippery if it’s raining and in some places the locals have installed bits of rope to help you get across them. Toward point N67° 53.811' E12° 59.601', the trail leaves the shore of Lake Stuvdalsvatnet and goes up a little valley oriented east-west. The trail goes over a stream, then joins the body of water connecting Lake Trolldalsvatnet to Lake Stuvdalsvatnet. Next, the trail follows the left bank of that body of water to the lake. There, you’ll see three or four tiny cabins (boat shelters). A gangplank enables you to reach the right bank of the lake. You can walk along the bank for roughly a hundred yards more. Take the same trail back.